December 3, 2002: India Secularism under Trial: The Emergence of Militant Hinduism and The Future of Indian Democracy. 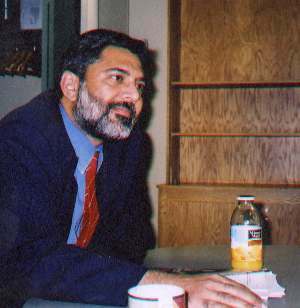 Introduction: Sidharth Bhatia is a Toronto-based columnist for Indian and international newspapers, a television producer, filmmaker, teacher and Associate Press Fellow at Cambridge University, U.K. Mr. Bhatia was invited to Ottawa by South Asia Partnership (SAP) Canada on December 3, 2002, to speak about the roots of militant Hindu politics. The presentation-discussion was part of South Asia Partnership Canada’s India Linkage Program. “The modern Indian nation state was premised on the creation of national identity, which subsumed all other identities: religious, linguistic, regional and even caste. It has been largely successful, in that there is a pan Indian identity, helped not the least by the notion of a historic India, but considerably helped along by the Nehruvian ideal of Unity in Diversity. Long before multiculturalism became a fashionable word, India had already put it into practice. But underpinning this ideal was secularism, not merely as the traditional separation of church and state, though that is important in itself, but as a social good, under which all religious were respected but the minorities were given certain special rights. Secularism was to be the credo, the mantra of this new nation, which had been formed by merging of over 550 princely states into a cohesive union. Under Jawaharlal Nehru and later under his Congress Party successors the concept of a secular assimilative nation-state was officially adopted as India’s path to political modernity and national integration that would not only accommodate and but also transcend India’s religious pluralities. agitation — which is not an exclusively Hindu Muslim issue, one may point out — there was the demand for Khalistan, insurgency in India’s North-East (primarily ethnic but with a religious flavour) and even, in the south of India, the demand for a separate Tamil homeland. resonance in Punjab anymore, even if here in Canada it may appear to be an ongoing concern. On the whole, the Indian state has managed to quell such demands for secession, but this would not have been possible without the firm entrenchment of the idea of a secular India. To put it another way, if the people of India did not think that they could live along with everyone else, they would not have demanded that such insurrections be put down. That has been proven time and again. by minorities. It could even be argued, that these were the responses of aggrieved minorities who felt the Indian union did not meet their needs, though the union was mostly accommodative. Today, we are seeing a completely different, in fact opposite situation; the biggest challenge to the Indian nation, and I would say, the state, is coming from forces claiming to represent the mainstream majority. What we are seeing is an emergence of extremist voices that claim to speak for Hindus, who are in an overwhelming majority in India and they are laying down demands which threaten the very idea of India. Nehru had warned that communalism by the majority would amount to fascism and his warnings appear to be right. The biggest area of concern is that the state has emerged to be complicit, as an actor and player in mounting this challenge to Indian pluralism, which goes under the name of Hindutva. Hindutva, which roughly translates as Hinduness, the political expression of Hindu nationalism, was always present in the body politic of independent India, though it was hidden for many decades. It is projected as the resurgence of Hindu pride; a reassertion of an identity allegedly long suppressed mainly by Muslim rulers, and is equated with nationalism. Thus Hinduism is established as not the dominant, but the only identity for true patriots and nationalists: not for nothing do we hear the constant assertion that Muslims and Christians should admit that they were all initially Hindu till they were converted several generations ago, perhaps by force or inducement. Underpinning this is the conviction that India is for Hindus and all minorities–who have been pandered to for a long time–must live within a set of rules established by the majority. common scriptural sources and formulate common modes of worship. allegedly cheer for Pakistan whenever India and Pakistan play cricket. Christians, much smaller in number, are accused of being more loyal to the Vatican, another outside force and of trying to convert poor Hindus with inducements of education and food. up later and which resulted in the formation of a Muslim majority country, Pakistan. This strand of thought was popular among some nationalists who were opposed to the British–though new evidence is emerging that the Mahasabha compromised with the colonial power–but the overarching ideology of nationalism was best projected by the inclusivist Congress, which had under its umbrella voices of the right and the left. The towering presence of Mahatma Gandhi and his protégé Nehru ensured that the centrist program prevailed and the Hindu nationalist element remained at the fringes. In 1947 India became free but at a bloody cost, with hundreds of thousands killed in sectarian riots and millions uprooted from their homes in the effort to cross over to the other side–Hindus and Sikhs to India and Muslims to Pakistan. In 1948 a Hindu fanatic who was angry at the appeasement of Muslims by the Congress and Gandhi personally, who was then insisting on financial compensation to Pakistan, killed Gandhi. Pakistan decided to become a Muslim state, India chose secularism. In India, the RSS was banned: In the new mood of secularism, a country exhausted by partition and sectarian riots and above all the assassination of Gandhi, did not want any more divisive talk. These tendencies seemingly disappeared from public life and discourse. However, they did not completely go away but just went underground. secure and special minority rights were enacted. These policies have remained in place for the most part till today, despite murmurs that this was minority appeasement, but no political party gave serious expression to this sentiment. It just would not have paid any political dividend. Indians accepted that this was the price for a secular nation. established caste hierarchies, contributed to the sense of turmoil and unease among many Indians. Into this breach came the Bharatiya Janata Party (BJP), the new name of the Jan Sangh, the political arm of the RSS, which now had the ban on it lifted. The Jan Sangh had tasted some power at the centre for a few months in 1977-79, but its links with the RSS were seen to be a problem and the government broke up. Now, though it was still not a major political force–in 1984 it had only 2 seats in a 543 strong house–it was assuming a higher profile. The BJP began attacking “pseudo-secularism” which pampered the minorities at the expense of the majority and demanded that special rights for minorities be taken away. Supporting the BJP was the World Hindu Council (Vishwa Hindu Parishad, VHP, in Hindi), a relatively new outfit with branches all over the world and drawing on support-moral and financial — from Hindu diasporic groups in the West. In 1990, the leader of the BJP, L K Advani, went on a countrywide tour on a converted Toyota, made to look like a chariot (an echo of Indian mythology here) spreading the word about Hindu awakening, by focusing on a campaign to “liberate” a 400 year old disused mosque in a small dusty town in North India called Ayodhya, where one of the pantheon of Hindu gods (Rama) was supposed to have been born several millennia ago. The demand to demolish the mosque was several decades old but it had not assumed a political colour, till the BJP, which had consistently posted poor performances in national elections, picked it up. The campaign caught on like wildfire, and like a fire, left death and destruction in its wake. Thousands of Hindu youth decided to descend on the small town where the mosque was located to liberate it. Though there was a court order staying any further movement on the issue, the mobs succeeded on December 6, 1992, to completely demolish the mosque. It was a seminal day in independent India’s history. sentiments in drawing rooms and even that by itself was shocking; now, deep prejudices were out in the open in a very violent way. The Hindu right has always claimed that India is a Hindu nation and Hinduness and nationalism are synonymous. They do not recognize Muslim contributions to India’s history and culture. They selectively concentrate on the intolerant Muslim rulers, extending their often brutal conduct to the entire period of Muslim rule and, even more problematically, to all Muslims. But such prejudices were not aired in public before; now they not only gained legitimacy, but also almost became mainstream opinion. The political dividends for the BJP were huge. From a pariah party, it came within striking distance of forming the government in 1996 but could not sustain it beyond 13 days. Two years later, the party emerged as the single largest political entity and formed the government with 20-odd coalition partners. It managed to win the next elections and maintain that hold and has now completed nearly three years in office. During that period, various organisations close to the party have fanned the flames of Hindu chauvinism and tried to impose a Hindu nationalist agenda. At the government level, this has included rewriting history books, changing school curricula, and allowing rabid Hindu organisations to say and do whatever they please. Such elements have never been restrained or told to stop attacks, verbal and otherwise, on minorities. The BJP has always pointed out that during its reign, there have been no Hindu Muslim disturbances. Though there were stray attacks on minorities, it was the party’s boast that there had been no major conflagration, and that it had become a responsible mainstream, centrist political entity. Then Gujarat happened. In February this year, mobs went on a rampage in parts of the Western Indian state of Gujarat, one of the most prosperous states in India with an image of being cultured and business friendly. Rampaging mobs destroyed Muslim homes and businesses, killed Muslims, including men women and children and drove thousands of people away from their homes. Newspaper reports speak of well-dressed people arriving in cars and looting shops belonging to Muslims, while sparing those right next door which were owned by Hindus. The ostensible reason for this fury was the burning of a train coach which was carrying Hindu pilgrims returning from Ayodhya. Fifty-nine people including women and children died in the fire. This action, sparked off, as the state’s Chief Minister put it, in Newtonian terms, a reaction, except that it was grossly disproportionate to the original crime. Various reports done on the incident and pogrom that followed have blamed the state’s police for inaction in saving victims, and have pointed out the involvement of high level state officials in ensuring that the police stayed their hand and did not take any preventive action as Hindu mobs took revenge. A Human Right’s Watch report paints a chilling picture of state complicity in the religious violence in Gujarat. This marks the first time when the state has emerged as a major player and actor in violence by mobs, a qualitative change from previous such situations in India. Instead of forcing the Chief Minister, who was making provocative and racist statements, to resign, the Central government backed him to the hilt: he emerged as a kind of superstar and is leading the party in the campaign for elections that will take place on December 12. It should also be pointed out that that the riots took place days after the party posted its worst ever electoral record on provincial elections and this was the hardliners way of signaling that its reliance on the middle ground was over. From now on, it would be back to the basics that had won the party electoral support originally. In fact, for the past three years, the more hard-line elements of the larger Hindutva family have complained that the BJP in power has become soft and has gone back on its promises to restore the primary place to Hindus. Thus the BJP itself is being accused of pseudo-secularism. check. Militant Hinduism and the pride of Hindus is the platform on which the elections in Gujarat are being fought. If this formula pays off in Gujarat, then the party and its sister organisations may fine-tune it in time for parliamentary elections two years from now. Social polarisation, accompanied by a perceived threat from Muslims — within and outside India — because the ones in India have been portrayed as a fifth column of international terrorism, may be a good vote catcher. Another point remains to be examined and this is a question that has vexed observers for a long time: just how did these tendencies emerge so suddenly in a country where secularism is enshrined in the constitution and presumably in the body politic? Were there millions of closet militant Hindus who simply came out of the woodwork once the time was right and voted the BJP into power? Who are these people and why were they hidden so long? The answers are not easy: one must look for a complex set of reasons. The decline of the Congress party which stood for secularism, is the backdrop for the emergence of the BJP. The flirting with religious politics by the Congress is another factor that may have made sectarianism less unfashionable than in earlier times. One must also look at the burgeoning neo-middle classes, richer than all previous generations which embraced consumerism as modernity but simultaneously began looking towards culture and tradition for support. The advent of globalisation has been welcomed in India as much as everywhere else, but it has also shaken people who fear that their own cultures will be destroyed. Hence, we see even in popular culture a reaffirmation of the conservative Hindu identity which is largely based on myth: joint families, where everyone knows their place and in which modern ideas don’t invade. It’s all about culture, religion and ritual, all cleverly juxtaposed with nationalism: what is Hindu is Indian and from that follows, what is not Hindu is not Indian. Much support has also come from overseas to organisations like the VHP which have collected millions of dollars under the garb of charity from diaspora communities, which, more often than not, tend to be more culturally conservative then their counterparts in the homeland. Much of this money has gone towards temples, Hindu education and the like in India. This appeals to the large, conservative to mainstream sections of the diaspora, and assuages their guilt. It is the VHP that has fanned most of the anti-minority rhetoric in India and is now calling even BJP leader, Advani, a pseudo-secularist! The revolution has begun to devour its own children. the seeds and reaped the fruits. But without a social base it could not have prospered. This social base is the most worrying factor because it might turn towards even more rabid forms of Hindu communalism. now. In a country with over 140 million Muslims and million of Christians, to say nothing of hundreds of other castes and communities, this can have very dangerous consequences. Once in the past, religious polarisation partitioned an entire subcontinent; will this be repeated in the future? Postscript: Since this lecture, the Bharatiya Janata Party (BJP) has won the provincial elections in Gujarat, on a Hindutva platform, by a two-thirds majority. Clearly, the party will interpret this as a call to return to its basics. There are 11 provincial elections coming up in 2003 and a general election due in 2004. Does this signal a further growth of militant Hindutva?